Thankfully, the end is in sight with the Swales happily lambing outside and the inside mules being finally down to double figures *the relief*. Whilst I have no new exciting tales to tell, I thought I would share with you some photographs taken from tonight’s farm visit. After all, everybody loves photographs of cute lambs. Polly was eager to accompany Dad and I on our ‘twice a day check’ of the outdoor hillsheep. 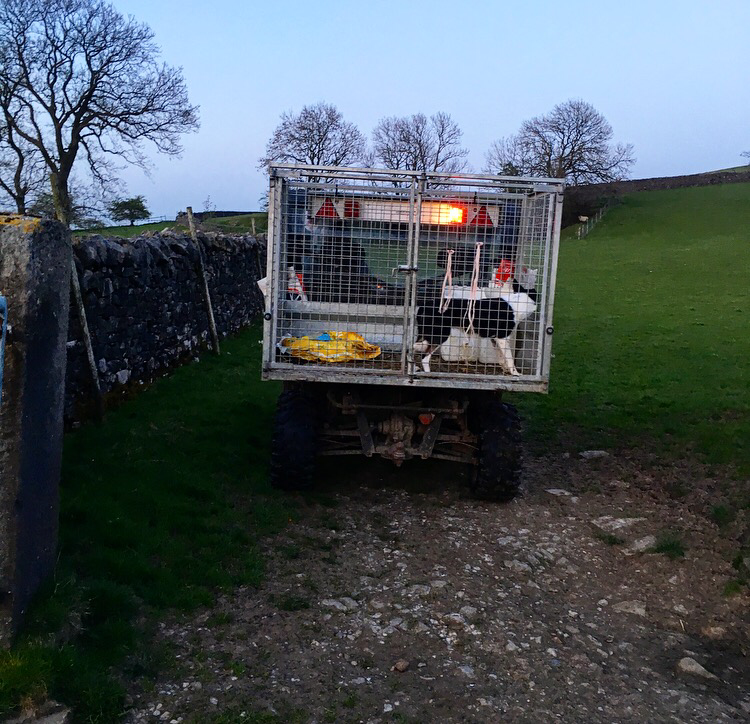 We do this to make sure that the sheep and lambs are all okay and are able to intervene if not! We drove around the sheep, bringing in any that we were concerned about. We check for problems as we ride around, looking out for sheep who have lost lambs (either dead or mismothered), who are ill or having problems lamb. Tonight, we only had to bring two sheep in – one had twins but had unfortunately lost one, whilst the other had neglected to look after its young lamb and it was starving as a result. As you can see, Polly was obsessed with the poorly lamb and wanted to get stuck in helping. Additionally, it is an also an opportunity to take in our surrounding scenery, – that is when we have the time! For me, there is no better sight than a sheep outside with healthy twins. It makes me feel wholesome and proud of our work here on the farm. After checking the outdoor sheep, it was time to venture into the lambing sheds. We all have indivual tasks to get the jobs done quicker: I go around and fill the various water buckets and hay nets, whilst Dad rubbers and marks lambs. Perhaps the short straw, Mum’s job is to feed the many pet lambs we have acquired. Below are some general lamb photographs I took this evening for you to browse at! Before we left, the lambs decided to put on a race for us in their pen. Call it “The Lamb National”. Now it is time for a strong cuppa tea and a well earned rest – before we go back down later on to do it all over again! Oh they are precious! I am no farmer but I cannot agree with you more that the sight of an ewe and her newborn are life-affirming. I am staying on a working farm in Cornwall and I just saw an ewe who has birthed a pair of twins. I could see her placenta hanging behind her and I did not even feel like baulking. Nature is glorious and so is its way of sorting out affairs like birthing among animals.